The Company is committed to enhancing its corporate governance practices appropriately to the conduct and growth of its business, and to pursue a right balance between conformance and performance in its corporate governance. In 2004, before our listing, we established an Audit Committee and a Remuneration Committee to assist the Board in its work and to ensure these functions are the subject of rigorous, independent review. Shui On Land's Audit and Risk Committee comprises three members, namely Professor Gary C. BIDDLE, Dr. Roger L. McCARTHY and Mr. David J. SHAW. Professor Gary C. BIDDLE, Dr. Roger L. McCARTHY and Mr. David J. SHAW are Independent Non-executive Directors. The Chairman of the Audit and Risk Committee is Professor Gary C. BIDDLE. The primary duties of the Audit and Risk Committee are to review and supervise the financial reporting process and internal control system of the Company and nominate and monitor external auditor. Shui On Land's Remuneration Committee comprises three members, namely Dr. William K. L. FUNG, Mr. Vincent H. S. LO and Professor Gary C. BIDDLE. Dr William K. L. FUNG and Professor Gary C. BIDDLE are Independent Non-executive Directors. The Chairman of the Remuneration Committee is Dr. William K. L. FUNG. The primary duties of the Remuneration Committee are to evaluate the performance and make recommendations on the remuneration package for our directors and senior management, and evaluate and make recommendations on employee benefit arrangements. Shui On Land's Nomination Committee comprises three members, namely Vincent H. S. LO, Sir John R. H. BOND and Professor Gary C. BIDDLE. The Chairman of the Nomination Committee is Vincent H. S. LO. 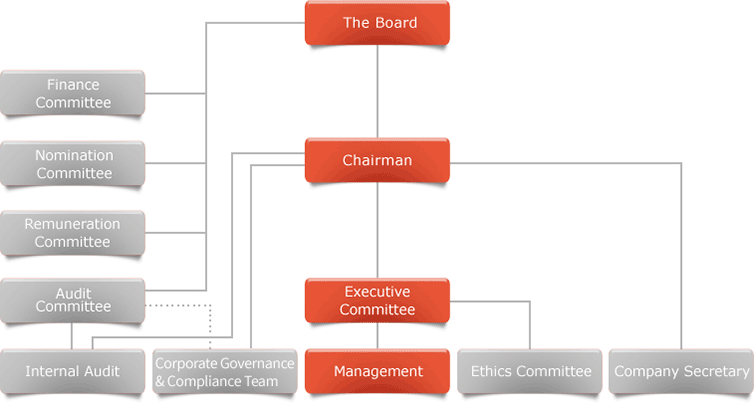 The primary duties of the Nomination Committee are to review the structure, size and composition of the Board, identify individuals suitably qualified to become members of the Board, and assess the independence of independent non-executive directors. Shui On Land's Finance Committee comprises seven members, namely Mr. Vincent H. S. LO, Mr. Frankie Y. L. WONG, Sir John R. H. BOND, Dr. William K. L. FUNG, Professor Gary C. BIDDLE, Mr. Douglas H. H. SUNG and Mr. Anthony J. L. NIGHTINGALE. The Chairman and the vice chairman of the Finance Committee are Mr. Vincent H. S. LO and Mr. Frankie Y. L. WONG respectively. The primary duties of the Finance Committee are to establish and monitor policies and guidelines on all financial matters. An Investment Sub-Committee has been established under the Finance Committee for the performance of certain duties of the Finance Committee as set out in the Terms of Reference.